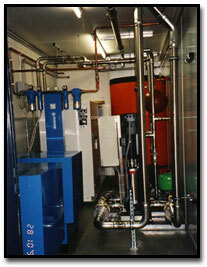 Leaks are a significant source of wasted energy in a compressed air system. A recent U.S. Department of Energy publication states that compressed air leaks waste as much as 20-30% of the compressor's total output. In addition to being a source of wasted energy, leaks can also contribute to other operating losses. Leaks cause a drop in system pressure, which can make air operated equipment function less efficiently, adversely affecting production. In addition, leaks also shorten the life of almost all system equipment, including the compressor itself, by forcing the equipment to cycle more frequently. Increased running time can also lead to additional maintenance requirements and increased unscheduled downtime. Leaks can also lead to adding additional unnecessary compressor capacity. Another Department of Energy publication reports that compressed air systems account for 10 percent of all electricity usage and roughly 16 percent of U.S. industrial energy use. Compressed air audits of industrial plant air systems can provide substantial energy savings opportunities for relatively low project costs. In fact, this same DOE report states: "In small to medium size industrial facilities, approximately 15 percent of compressed air usage be saved with simple paybacks of less than two years. In larger facilities, these savings could range from 30 to 60 percent of current system usage." Decreased service life and increased maintenance of supply equipment (including the compressor package) due to increased run time and unnecessary cycling. Increased energy cost due to excessive electricity usage. Fluctuating system pressure, which can cause air operated equipment to function less efficiently. Excess compressor capacity, resulting in higher than necessary equipment and maintenance costs. Although leaks can occur in any part of the system, the most common leak prone areas are: valves, flanges, packings, fittings, pipe joints, FRL's (filter, regulator, and lubricator), hoses couplings, tubes, condensate traps, and quick disconnects. It is important to implement a regularly scheduled program for identifying and repairing leaks in your facility's operations. Emissions Monitoring Technologies, Inc. has over 10 years of experience in designing and implementing cost effective compressed air leak detection programs. Leak tagging (multi-level, delineating repair priority based on severity). For more information on how Emissions Monitoring Technologies, Inc. can provide cost effective solutions to your leak detection problems, call (800) 497-4407 or email sales@emtech-us.com.